It’s true that Mallorca is famous for its beaches and magnificent scenery but that was not the only reason that Palma was chosen as the best city to live in by the British newspaper “The Sunday Times”. 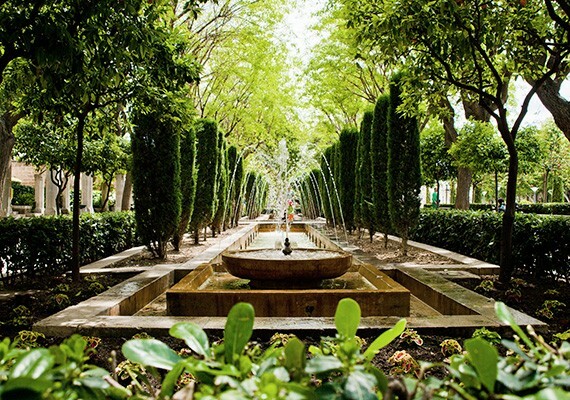 And if you stay in the Nakar Hotel in the heart of our beautiful capital city, you will have the best places, exclusive shops and the most vibrant night life with fantastic restaurants and bars at your fingertips really close to your hotel in Palma. The very best way to explore all these places is to take a stroll through the beautiful historic centre of the city. So we invite you to accompany us on our favourite itinerary through the city. This Gallery was opened in 2004 and is located in a part of the old City Walls. 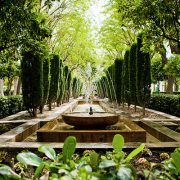 Visitors can contemplate works by Joan Miro (who lived in Palma for many years), Picasso, Anselm Kiefer and Andy Warhol among others. 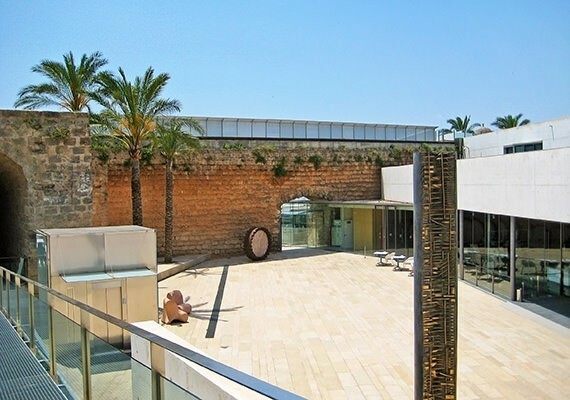 But we can recommend a visit to Es Baluard to those who are not especially interested in modern art since, mostly during the summer months, there are a series of musical events and the views from the gallery terrace are simply spectacular. The terrace has a separate entrance and from there you can see the wonderful Port of Palma, the Bellver Castle and a lot of the historic quarter. The same incredible views, or even better, can be enjoyed from the rooftop terrace of our hotel in Palma de Mallorca. We continue our walk along the walls to Sa Llotja, the name of the old Fish Market, a masterpiece of Gothic architecture in the Baklearic Islands and which was inspiration for several other similar buildings in the neighbouring Catalonia, dating from the Middle Ages. We now head towards two of what must be the most spectacular monuments in the city. Not only because of their imposing location but also because of their fascinating architecture and they are the Almudaina Palace and “La Seu”, the Cathedral of Palma de Mallorca. 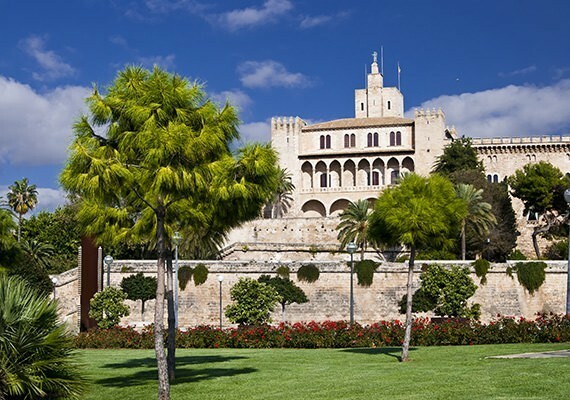 The Almudaina Palace is the Royal Palace of the city of Palma de Mallorca and is where the monarchs of Mallorca, Aragon and Spain held their courts. There is a mixture of Roman and Muslim architecture in this building since it was originally built as a fortification. Right next to it is the Cathedral which is more impressive for its architecture than for its actual height. 121 metres long and 55 metres wide, it stands out over the harbor and the bay. It can be seen from all over the city including from the terrace in our hotel in Palma de Mallorca. The Gothic srchitecture, with its Rose Glass Window, one of the largest of its kind in the world, is a source of amazement from all angles and therefore is a monument not to be missed. When you stay in a hotel in the centre of Palma, everything,including the best shops and boutiques are at your fingertips. The last place on our visiting list is the Plaza Mayor, the Main Square. On the walk from the Cathedral to the square we pass by some beautiful buildings dating from the Middle Ages including the Santa Eulalia Church built in the 13th century. Once In the square, one of its most attractive features are the yellow facades and green shutters we can see all around the square. The square has streets leading off on all sides and there are many shops in this area. To end our walk through the historic centre of Palma de Mallorca we leave the Main Square heaing towards our hotel in Jaime III. There are many designer boutiques on this street.